GREENBELT, Md., Jan. 18, 2013 — NASA’s next moon mission has the acronym LADEE (Lunar Atmosphere and Dust Environment Explorer), but they’ve already sent a lady to the moon — or at least the image of one. Using a precisely timed laser, scientists at NASA’s Goddard Space Flight Center have beamed an image of Leonardo da Vinci’s masterpiece, the Mona Lisa, to the Lunar Orbiter Laser Altimeter (LOLA) instrument on the Lunar Reconnaissance Orbiter (LRO) orbiting the moon. The famous face traveled nearly 240,000 miles in digital form from the Next Generation Satellite Laser Ranging station at NASA Goddard, the first demonstration of laser communication with a satellite. To clean up transmission errors introduced by Earth’s atmosphere (left), Goddard scientists applied Reed-Solomon error correction (right), which is commonly used in CDs and DVDs. Typical errors include missing pixels (white) and false signals (black). The white stripe indicates a brief period when transmission was paused. Courtesy of Xiaoli Sun, NASA Goddard. The LRO spacecraft was the best choice to test out the novel communication method because the spacecraft was already equipped with a laser receiver. While most spacecraft exploring beyond Earth’s orbit are tracked using radio signals, the LRO can be tracked via lasers as well. Precise timing was the key to transmitting the image. 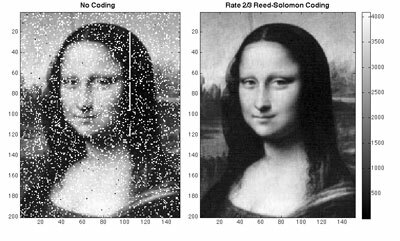 LOLA scientist Xiaoli Sun and colleagues divided the Mona Lisa image into an array measuring 152 × 200 pixels, with each pixel converted into a shade of gray — represented by a number between 0 and 4095 — and then transmitted via a laser pulse to the orbiter at a data rate of about 300 b/s. Once the lunar orbiter received the laser pulses, it reconstructed the photo based on the arrival times of the laser pulses, and then sent the image back to Earth using the spacecraft’s radio telemetry system. Turbulence in Earth’s atmosphere introduced transmission errors even when the sky was clear. To overcome these effects, Sun’s team employed Reed-Solomon coding, the same type of error-correction code used in CDs and DVDs. The experiments also provided statistics on the signal fluctuations caused by Earth’s atmosphere. “This pathfinding achievement sets the stage for the Lunar Laser Communications Demonstration (LLCD), a high-data-rate laser-communication-demonstration that will be a central feature of NASA’s next moon mission, the Lunar Atmosphere and Dust Environment Explorer,” said Goddard’s Richard Vondrak, the LRO deputy project scientist. After LLCD, NASA will set its sights on the Laser Communications Relay Demonstration, the first long-duration optical communications mission, which will help to develop concepts and deliver technologies applicable to near-Earth and deep-space communication.